Bassnectar has put together another amazing lineup and the 2019 Deja Voom looks like it is going to be yet another amazing festival on the Mexican Riviera Maya. Along with an amazing lineup, which you can see below, the four-day festival includes some awesome adventure opportunities such as zipline tours, ATV tours, catamaran cruises, daily yoga sessions, workshops, and even a beach clean up because it is our duty to give back to the beautiful locations we enjoy. Deja Voom is an all-inclusive experience at The Barceló Maya Grand Resort, and features headline sets from Rezz, The Glitch Mob, Digital Mystikz and more. Deja Voom kicks off for the first time Wednesday to Saturday, Feb. 27 to March 2, 2019. Tickets are on sale now on the Deja Voom website. 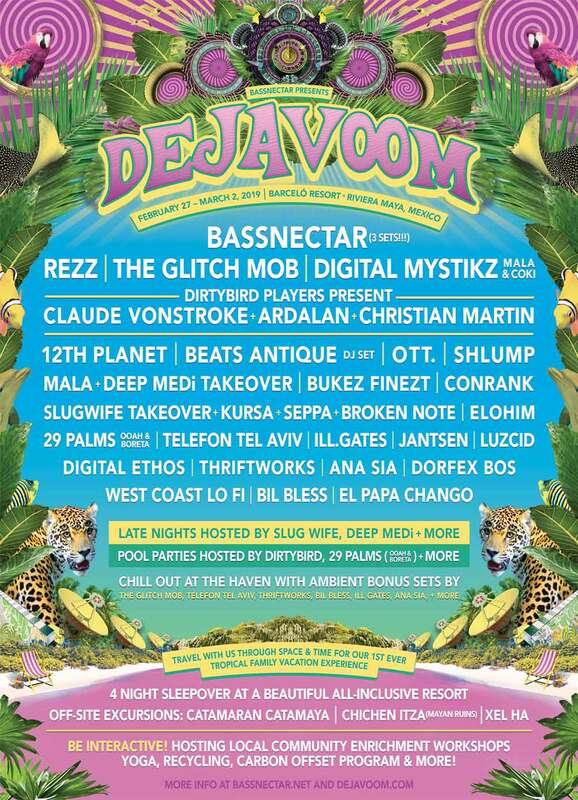 Check out the full 2019 Deja Voom lineup below while listening to some Bassnectar goodness. It also appears that Bassnectar is enjoying the planning and preparation stage of his upcoming Deja Voom festival. 😉 Can’t wait for this one!